Reserve studies involve two distinct phases – the physical analysis and the funding analysis. The physical analysis includes, but is not limited to, determining the association’s legal responsibility of repairing, replacing and maintaining association property (components) and identifying components and their condition, cost and useful life. The funding analysis includes preparing a funding model that considers the cost and frequency of repairs/replacements/maintenance procedures. This funding model generally includes provisions for inflation on future expenditures, interest earned on reserves and income taxes. Funding Theory – The theory behind funding is simple: determine how much money the association should set aside in the replacement reserve bank account each year so there is always enough money to pay for needed repair, replacement and maintenance expenses and assess accordingly. Since this funding model is based on numerous assumptions, many association professionals prefer to include a contingency amount in the funding model. Although the theory of funding is relatively simple, the calculation of the required contribution to reserves is complicated by the various methods of funding and the determination of the appropriate contingency. For purposes of this article, contingency is defined as “the amount of cash set aside in the replacement reserve over and above the calculated amount needed to fund 100% of needed expenditures”. In other words, it is extra cash to fund unbudgeted expenditures or “surprises”. Community Association Institute (CAI) Reserve Specialist and Association of Professional Reserve Analyst standards include three acceptable funding models – baseline, threshold and the fully funded model. (Note that there are other terms that describe these models; for sake of simplicity I am using the above terms). The baseline method involves preparing a funding model that funds all expected costs over a specified period, in many cases thirty years. Although this model funds the replacement reserve bank account for all expected costs, it does not include a contingency amount should any components cost more than expected. Proponents of this method only want to fund expected costs to maintain, repair and replace common area components. Note that this model is the bare minimum of funding and assumes there will be no surprises. Over a thirty year period, the baseline funding model would show a cash flow projection that funds all expenditures and at some point the cash balance in the replacement fund bank account would drop close to a zero balance and then start building cash for the next major expenditure. The year the cash balance drops close to zero is risky to the association since there is no extra cash to pay for surprises. The threshold method involves preparing a funding model which funds all expected costs much like the baseline method but also includes a contingency amount for surprises. Reserve study specialists refer to this contingency as the “threshold”. The threshold method would provide an amount that the projected replacement reserve cash balance would not fall below, say $100,000. The $100,000 is called the threshold and provides needed funds to pay for surprises. Proponents of this method realize that over a thirty year period, unexpected costs may arise and it may be prudent to have extra cash to pay for these surprises. The challenge for reserve study providers is determining the amount of the threshold or extra cash. The fully funded method uses a formula for computing the threshold. This formula mirrors the method used for computing depreciation. It computes a threshold that in some cases allows funding for twice the amount of expected costs. Knowing that the fully funded method, if 100% funded, provides for a very large threshold, reserve study providers often use a funding target of less than 100%. Please note that the higher the percent funded, the more extra cash is kept in the replacement reserve bank account as a contingency, over and above the amount necessary to pay for all expected repairs and replacements. Proponents of this method realize associations have “surprises” and it is prudent to have as much cash as you can as a contingency to provide for these costs. Risk of Special Assessment Many reserve study professionals present statistics that show the risk of a special assessment based on the percent funded. For instance, if an association is 50% funded, these statistics indicate there would be an 11.6% chance of a special assessment. The higher the percent funded, the lower the potential of a special assessment. Please be aware that these statistics have been compiled by a reserve study provider and not vetted by CAI. However, if the contention is that the more extra cash an association has in the bank, the less likely the association will be likely to special assess due to surprises, then the underlying theory appears reasonable. The design, materials or workmanship on original construction is not adequate thus requiring repairs, remediation or this may result in a significant reduction in the estimated useful life of components. A complete building envelope inspection may catch issues early on that may reduce the cost of repairs and may allow the association to bring an action against the developer or contractor. This investigation may include intrusive openings around decks, windows, roofs and siding. The association does not adequately maintain the components which may lead to unexpected repairs or significantly reduced estimated useful lives. A maintenance plan consistently followed by the association may help components last longer with fewer repairs. The reserve study does not include all components that need to be funded. Missing components may include plumbing and irrigation systems, water/sewer lines, dry rot, windows and doors, deck assemblies, asphalt, major landscaping projects, concrete issues including spalling/ rusted rebar and replacement of siding and trim. Failure to include all components will likely lead to a special assessment to pay for unbudgeted repairs. Since it appears that the threshold and fully funded model expect surprises, should associations that have procedures that address the risk of surprises be governed by the same funding rules as associations that do not? 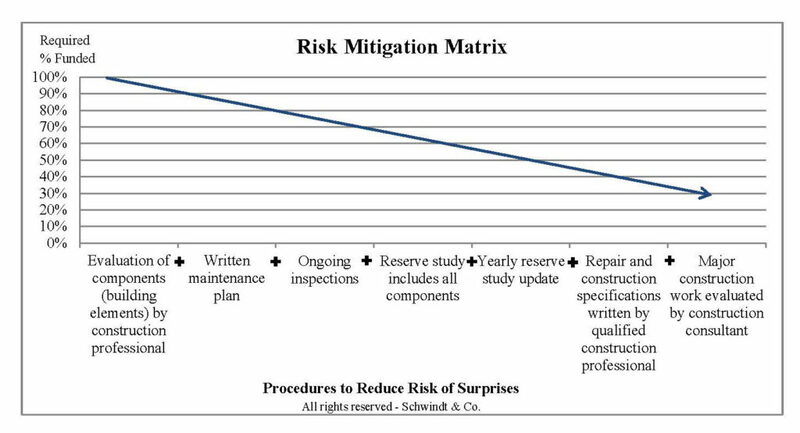 Graph II illustrates the relationship between employing best practices and the probability of surprises. Many reserve study providers recommend a percent funded of at least 70%. The matrix below shows that if associations follow best practices in maintaining common area components, the percent funded could be much lower because the likelihood of a surprise is diminished. Note that this matrix addresses the fully funded percentage but can also be used as a tool to determine the required threshold using the threshold method. David T. Schwindt is a CPA and credentialed reserve study provider and is the owner of Schwindt & Co. Schwindt & Co provides accounting, tax and reserve study services to over 500 Associations in the Pacific Northwest. Comments should be directed to: dschwindt@schwindtco.com.